A plaque commemorates the crossing of the Ovens River by Major Thomas Mitchell's exploration party in October 1836. This plaque replaces the original plaque. 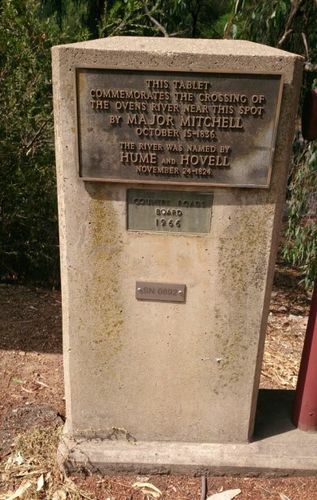 The original plaque of Major Mitchell's crossing and the naming of the river by Hume & Hovell was erected on a tree near the bridge and unveiled in 23rd April 1915 by Mr Frank Tate, then Director of Education.